Everybody wants to get a high rank in Google. Many online businesses get disappointed as a result of wrong SEO strategies and poor guidance. Step1: * 2 High quality backlinks from 2 High PR web 2.0 sites. I will post unique version of an article that is relevant to your niche to each web 2.0 site. All the web 2.0 sites have PR 9-8 and are do follow. 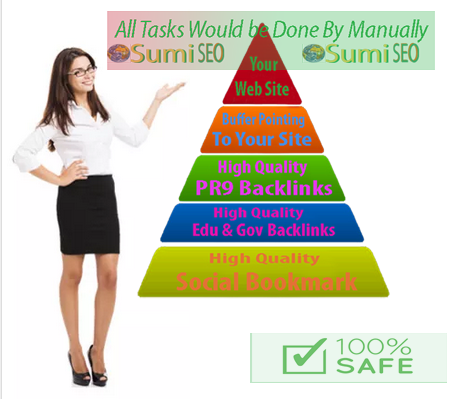 Step2: * We will create 15 PR 9-8 High Authority Backlinks. All Links are 100% safe and reliable and on some of the BIGGEST sites on the Web - All Links will be DO-follow. This will improve your Google search result. I will use your given anchor text and short description text wherever possible on the page. This puts your link in context with the topic of your site. The anchor text and description text should describe the topic of your site. Step4: * 15 High quality backlinks from PR 2+ social bookmarking sites. Title and description will be spin each time before posting. I will also provide the user names and passwords to control these links. And future link modifying service is totally free. Get Ranking with Links Pyramids 2016 is ranked 5 out of 5. Based on 7 user reviews.